“History as Inspiration: A Writer’s Journey in the Eastern Sierra” is the title of the illustrated talk at the Monday, February 4th meeting of the Mono Basin Historical Society. 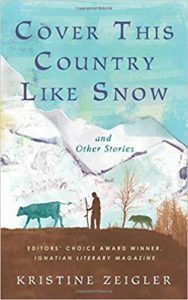 Author Kristine Zeigler’s recently published book, COVER THIS COUNTRY LIKE SNOW is a collection of ten fictional stories set before, during and after the water wars between the sophisticated City of Los Angeles and the rural underdogs from the Owens Valley. Gather at 6 PM with potluck dinner and short business meeting at the Lee Vining Community Center and the program begins at 7 PM. From swashbuckling mountain men, ranching women and miners, to Native Americans, city boosters and even one very ancient tree, these tales evoke the wild West and all its tales of heroism, magic and mystery. Books can be purchased and signed by the author at the event, which is free and open to the public. Visit the Mono Basin Historical Society webpage at www.monobasinhistory.org.